The ground floor offers a large traditional long bar with a number of boxes for social gatherings. Large screen TVs ensure that our patrons with a sporting interest are well catered for. Regular entertainment includes a free disco every Saturday night. The middle (Boutique) bar features regular live gigs and club events and is available for private functions and charity fundraisers. The top floor (Loft) operates as a pool room throughout the week with regular club nights every Saturday. Excellent food served 12-9pm daily. Have you got Google Earth on your computer? 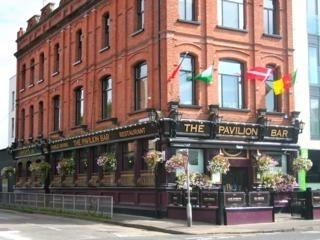 If so, then download the Google Earth view of Pavilion Bar. Is this the wrong position for Pavilion Bar? If you think so, then modify its position. Click / Tap the button above to get directions from where you are to Pavilion Bar. Good food, decent entertainment. Definitely improved over the years. Best Bar on the Ormeau. greatly improved bar! beter weekend music and... flashy dance floor lights!! Been in this bar quite a few times :0) Good crowd..food is great!! (price wise too) Roll on Halloween party in there on the 29th Oct.. cant wait !! Defo too many tv screens. I was in on Friday night and the DJ was blasting crap songs while 6 tv screens glared with golf on them.. rock n roll!! Never had a problem getting served at the bar, usually its just the nod for same again. Pool room on the top floor is great and the food has always been good anytime I've tried it. I'd particularly recommend the 2nd floor on a Sunday afternoon. I prefer the pavillion to the neighbouring errigle as its full of real people and not the poncey crowd the other bar attracts. Have to agree with the comments about the staff, too busy chatting and pretending not to see you as you patiently wait dehydrating under the glare of the many, many tv screens all showing different sports matches. Nice beer and food though, so it aint all bad! would be a great bar with decent staff, less televisions and a better dj..! If you have an IQ over 50 you will be disappointed. Seriously the bar is packed with saddo 40-50 years olds having school boy conversations about football. The staff are the worst I have ever experienced in any bar and the food terrible!! But I would recommend it to the type of person who thinks his opinion on who Man utd should next sign and thinks his opinions matter- knock yourself out there – there plenty to chat to. no need for invisibility cloaks in this bar, the staff pretend not to see you anyway! never again the men have no manners you think u just stepped into a time warp bad staff food could kill !!! Really good job on the renovations - looks great now! great bar if u're a fan of the ads on sky football as thats all you can hear when u're in.. I like this bar although the staff on a sunday night need some serious customer service training!!. This is the worst bar I have been in in a long time. Grotty, cliquish, with unhelpful staff and customers so freakish you may be forgiven for thinking you had walked into the cantina in Star Wars. Do not even think about taking your girlfriend here as these gentlemen look and act like they have not seen a woman in years. As for the food, just don't. The owners keep messing with this place being overrun with loud TV's, dodgy disco in he bottom bar etc...A lot of regulars have shifted from here! Used to have best pint on the road but has gone down hill recently however still better than he Errigal a proper pub hopefully it'll be back to its best soon! Great bar for food, sport and craic (well priced). The staff are very friendly and efficent. Best pints of Guinness on the road. Always a great atmosphere for watching the footie. Just had lunch there today - had a baked potato with Chilli & my friend had the enchilladas - yum! Had to wait a while for the food, though it did look busy & was definately worth the wait. Would definately go back.